Mil-W-4088 (specs) and Mil-W-27265 (specs) nylon webbing. Mil-W-27265 is the resin-treated version of Mil-W-4088. Resin-treatment adds rigidity to the webbing. 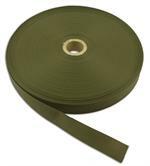 All mil-spec nylon webbing listed on this website is made in the USA and Berry Compliant. 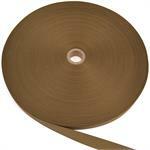 A-A-55301 nylon webbing is a highly durable, rugged thin nylon webbing that is long lasting. It is designed to be long lasting and resistant to abrasions, tears and scuffs. Mil-T-5038 Grosgrain Nylon Webbing is an ultra thin ribbon material useful as a finished outer layer of webbing for your application. Mil-W-4088 / 27265 consists of many different types of military-spec nylon webbing, with uses ranging from binding to military belts. 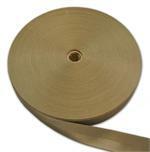 Mil-W-5625 Tubular Nylon Webbing is heavy, strong and hollow in the middle. 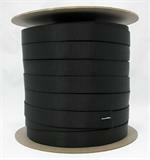 It can be used as protective covering for cables, tubes, hoses, and shock cord. In parachute construction, it can be used for making static lines and shot bags.